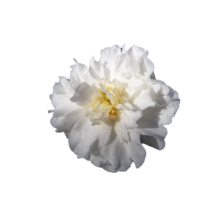 Camellia White is a wonderful, fragrant peony with a fresh colour palette. White? Not really: rather a very pale pink becoming white in the centre. We could call it a blush but then we would knife the hints of cream. Therefore we think the name will cover for its colour in the future. Camellia White is something special. Roy Klehm is the founding father of Camellia White. Klehm has also created varieties such as Brother Chuck. It bloomed for the first time in 1986 and was registered in 1998.